Na tv patrol na yan tapos mabagal pa din. Hi. Nag process ako ng clearance ko sa Concentrix natapos nung February 14, 2018..indicated sa slip and sinabi din personally na 30 days after makukuha na. But until now, ni email re update ng final pay wala. Nag email sila saken last March 15, 2018 ansabi, Good day. Apologies for the late revert. Your final pay is currently being processed. Kindly wait for the e-mail communications until Friday this week including final pay amount, final COE, ITR and waiver form. Your incentive and disputes are included in your final pay. - pero til now, wala padin. Ano po kaya ang dapat kong gawin? dami ko na inquiry emails, lang nag ri reply . May naka usap ako sa HR, tinuro ako sa Final Pay department na wala namang contact number and email lang din daw.. madami po kaming nag aantay ng final pay til now, nga-nga kaming lahat. Eversince naman talga, madaming disputes sa Concentrix in terms of pay. I really regret na nag apply pa ulet ako sa knila. Buti nlng natapos na yong contract ko with them. Please help naman po. Thank you! sir, may idea ka magkano deduction pag di ko mabalik yung ID? di ko makita eh. 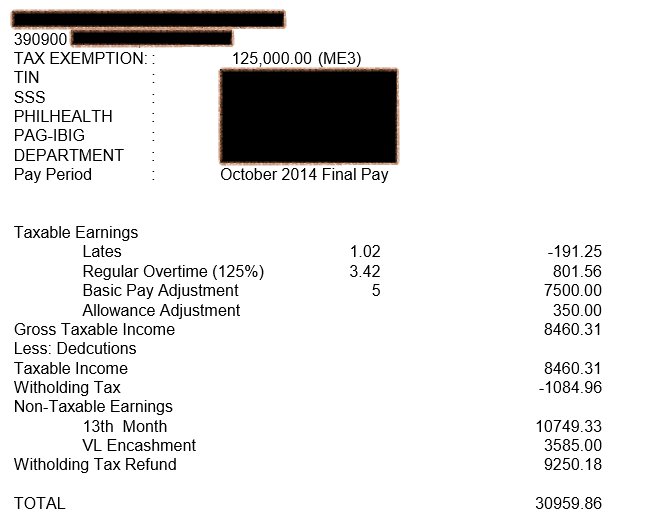 Sa Concentrix dati nagwowork husband ko, natapos nya clearance Feb 21 2018, tapos naipasa nya Letteer of Commitment from his new employer na sila na magbabayad ng SSS loans nya, pero nag email concentrix, zero ang final pay kasi dineduct na yung bayad sa sss loan dun sa final pay. E may Letter na nga na ipinasa. Na-TV patrol na noon, hindi pa nadala tong Concentrix. HI. IS SL BALANCE SHOULD BE INCLUDED IN THE FINAL PAY? MY HR TOLD ME THAT THEY WILL NOT PAY MY SL BALANCE SINCE IT'S FOR RESIGNATION. lampas na ang 30 days wla pa akong notification or email na receive kung makukuha kuna ba ang back pay ko o hindi. In fairness sa CVG within 30 days release na. release agad within 30 days. sana mag kano ang 12 months employment sa kanila. last january 5 2018 kc effectivity ko. Ano pobang gagawin namin ng husband ko ngresign dn sya sa Concentrix nung jan 25,2018 tas etong april ngemail yung final pay ng concentrix.nkakuha nalang sya 101pesos.nakakainis kasi hindi mo malaman san nila nkukuha yung computation nila. San ba pwede magreklamo or tawagan manlang.ng email nko sknla pero wla pang reply. Please po pa help naman. Hilow gdeve I'm jonefer adaya ano bang gawin sa back pay ko 3 months na cxa tapos noon pinapafollow up ko this day sa accounting department sa acabar savi Mali raw ang resignation letter e complete lahat NG requirement ko sa pagsubmit. Ngaun sinsavi nila this day na Mali raw. E bkit now lng sinsavi sa akin. E possible na mgantay ako ulit NG 60 bago ko makuha ang back pay ko e dapat mareceive ko this Nov. Ang back pay ko. Dhil sa is ang Mali lng na ngaun lng sinsavi sau after 3 months sino ang ba ang May Mali zila ako. Padvise nmn ano gawin ko plus. Is it possible in a company that if you hired in April, no tax refund? To answer your question, No tax refund is possible if the previous company has exactly computed your tax due for the year. Ok, but been in two different companies and get refund, 3,500+ . I worked with Teletech for a year and I was shocked with my final pay as it doesn't have any tax refund though I was expecting to have the tax refunded from Jan- Nov - Is it really possible to not have tax refund at all? Just want to share my experience with the back pay case mentioned in no. 3. My COE, ITR and quit claims aren't released immediately. I resigned in April and I received all due to me in November. I just called the DOLE and mentioned my case, and the officer said I have the right to file against the company because it took so long, and I'm already cleared. When I mentioned to my ex- company's HR about my conversation with DOLE officer, they immediately processed my papers and received everything. DOLE is very much willing to help the employees. The officer even urged me then to go straight to DOLE to quicken the process. But, I still have compassion for my previous employer and became considerate and patient. Hi May i know the contact number of the person you have spoken in DOLE, i might be needing help from them since i have the same issue with you. its been 5 months and yet my backpay is still in "process" according to the HR of my previous company. Thank you. I was discontinued from a BPO just yesterday although our payout for the 20th is being released.. i had rendered service for 3 days.. shouldn't my last 3 days be for back pay.. i see no reason to hold my salary on the 20th. Since salaries are given out on the 20th, usually you will have to wait for this date or even longer in case you resigned or made redundant. The 20th serves as the cut-off date. they will have to compute other things before they give you ur final pay. Hi, I just want to extent my gratitude to attorney Malu, she answered all my legal issues right away and gave me a direct transparent advise. Thanks also for this website: call center focus, offering free legal advise and facts about working in a bpo. Since your husband is with the company. Can you clarify with him to ask the HR again? If not, then ask him to call DOLE hotline in the morning and ask them the tax return. You are entitled to a tax refund bec. at some point you resigned and did not finish the year with them. This is your payment to the gov't and the company doesn't share on it. Do not sign the BIR 2316 when you have not received your final pay. The form is for quit claim and release. Meaning, the company has already paid you and they do not owe you anything else. If 2 months has lapsed and I have not yet receive my last pay? Can I call for DOLE for help regarding this? What if the company practice that the release of last pay is after 3 months, is this a valid reason? Currently working for cvg for 3 years,and implanning to give my resignation effevtive immediately,usually po how much ang nakukuha na backpay? Magffile ako ng resignation on October 28 tapos last day ko eh December 2. Ang labas ng 13th month namin is last week ng Novemeber. Makukuha ko pa kaya yun? Hi Atty I just have question po I was working at firstsource Ltd from Feb 2016 til oct 2,2016 I'm done render my resignation letter and completed it though in a unexpected situations during rendering my resignation I got sick and my bro died I give all the paperwork to hr it's all documented and approved plus that's the cases I only been absent since I got hired. Now my question is how would be the possible compution of my backpay am I entitled to have a tax refund or not ? Good Evening po. Empleyado po ako ng isang BPO company sa QC. Pero po naka LWOP po ang tag dahil po sa naaksidente ako sa motor. Sasahod po kami ng Dec 9 pero po since Dec 6 2016 po ako nagsimula na hindi pumasok. Mahohold po ba ang sahod ko nun? Salamat po. If I was deducted of something that shouldn't be. where can I file complaints ? Hello I resigned from my company in taguig. I completed all of my clearances before and on my last day. The HR told me that I have to wait 60-70 Days for my backpay. I emailed our HR with regards to my backpay and got no response from her. Is this normal? Should I call DOLE? I just have question. I already receive my backpay last feb 2017 binalik ko sa kanila ung backpay ko due to wrong spelling of my name. they told me balikan ko daw 1 week, after 1 week I follow up hd parin daw ok ung backpay ko, until now 3weeks ng nakakalipas wala pa rin, any tips, advice or suggestion actions?.. Question lang po. pinapipirma nila ako ng quitclaim. pde bang hingin yung computation sa kanila? binibigay ba muna sa inyo yung computation bago yung cheque o cheque nlng agad agad? kasi ayaw kong pumirma muna. hndi kasi ako kumbinsido sa matatanggap kong final pay lalo na't nalaman kong hindi pala nila pnprocess yung TIN(meaning wala akong record sa BIR) pero nag deduct sila ng tax sa every payslip ko. nagtanong na ako tungkol dun pero hindi sila nagrereply. This might be a little late pero kung need mo pa ng advice, yes kailangan mo yung document with the breakdown of your backpay inclusion (pro-rated 13th month, leave conversions if applicable and final cutoff pay that was put on hold). Huwag kang pipirma ng kahit ano until they provide it. Kung ayaw nila ipakita yung breakdown, go to DOLE. ano yung number ng DOLE na pde tawagan? it's been more than 90 days na pero wala pa din response from them. it was an immediate resignation last feb 3, 2017. and i was advised to follow up on or after may 5, 2017, which i did. no response. "3. Companies are aware that there is no provision in the labor code in relation to the period of payment of last pay which technically allows them to hold it off. In case the reasonable time has lapsed and you have documented a proof that your previous employer has not given your last salary, you may now file a complaint at the National Labor Relations Commission (NLRC) or Department of Labor and Employment (DOLE)." Given this scenario, so pag sinabi ng company na it would take 45-60 WORKING days, 45-60WORKING days nga? This by the way would equal to: 2.1-3 months (that is kung walang holidays pa yan). Isn't this too long for the company to process someone's back pay? Do we have to wait for 3 months bago mag file ng claims sa NLRC? Can I still get my backpack even it's more than 4years already? I resigned Teleperformance last march 2017 and was advised that I need to wait up to 90 days to process the final pay. I went to their office last june 2017 and was advised that it's still in process. I received an email this july but still saying it was still in process. Anything else I can do aside from waiting? by next month mag 6months na wala parin back pay ko ask ko po if ano normal lng po ba yun?? Hi i have few questions po. I was resigned from BPO last jan 1 2014 and i came back to claim my final pay last may 31 2017 given na na.complete ko ung clearance form nila and allowing dem to deduct ung cost ng bandge at headset para lng makuha ung fibal pay ko which infact na sauli ko sa kanila at wla silang record na nasauli ko un. Ngaun sinasabi nila skin na ng lapse na dw ng 3 years ang pag kuha ko ng back pay ko at hnd ko na dw un makukuha lahat kundi ang clearance lang. Gusto ko sanang magtanong na my time limit ba ang pagkuha ng back pay sa company? At nabasa ko na hnd pwede mag deduct and company sa back pay kahit na its a lost/damage of equipment eto.? Salamat po sa sagot. I would like to ask kasi po nagresign ako sa previous Company ko last July 5, 2017 tapos Attorney until now hindi pa sila nagbayad. Yung isang HR is tinawagan ako kasi ehold daw nila yung last pay ko pati incentives kasi daw maraming losses dun sa isang dealer ng gadgets na hinandle ko dahil daw sa akin na hindi ko pinull-out kaagad yung items kaya maraming nawala dun sa branch na yun which is it's beyond my control kasi under siya sa account ni dealer nasa loob lang ng store nila tapos yung total amount of losses is ichacharge nila sa akin. Hi po.. ask ko lang Po kung gano katagal Bago makuha Ang back pay.. kaz nag resign po ako nang July.. It would take 30 - 60 working days. Hi ask ko lang kung makakatanggap po ba ko ng 13 month pay pang5months na ko sa dec 15 at endo na po sabi ng iba wala daw dahil sa backpay iisa lang ba yung 13 month pay sa backpay? I need some advise kung ipapaDole ko ba ung company ko for delaying my backpay. Oct 6 2017 nagresign ako. medical reason. Ilang months nakong may sakit and I'm not going better. Oct 14 nagpaclearance ako. Hiningian ako ng copy ng resignation letter ko, sabi ko nasa manager ko. Pumunta ung isang manager namin to explain at nagkasundo sila na approve na ung clearance kasi ipapasa naman daw nung manager ko ung resignation letter (which I find it odd kasi diba dapat nung nagresign ako eh dapat may copy na sila nung letter?) Anyways, so cleared na ko nung Oct 14 and they gave me stab for backpay. Nakalagay dun 45 days. But the thing is, I was advised nung araw na un na I have to wait for a text from them then after that tsaka ako mag count ng 45 days. I asked kung anung klaseng text at kung kelan ko makukuha. Sabi sakin, within a week makakatanggap ka ng text, the person who processed it assured me too na di lalagpas ng 1 week eh may mare receive akong text. Oct 16 2017 ay nakareceive ako ng text though tungkol un sa recruitment process nila. Weeks past eh same na puro ganun ung narereceive ko so I thought na baka un na nga un. Nov 21 bumalik ako to check kung kelan ko ba nakukuha. Sabi sakin said Nov 27 ung 45th day so balik ako. bumalik ako ng Nov 28, pagdating ko I was advised na Hindi pa available at kausapin ko ung nagprocess nung resig ko, I asked why, sabi sakin "kasi Nov 23 lang po naupload ung file nyo". I talk to their manager kasama ung nagprocess ng resig ko but they can't give me an exact reason kung baket natagalan. Kesyo "special case kasi" or "may process kaming sinusunod and we can't disclose it to you." Sabi ko, "alam nyong pwede ko kayo ireport, right"? Sabi sakin, wala naman daw sa batas na bawal ung ginawa nila. In fact nga daw eh Hindi lang ako ung lalagpas ng 45 days. Sabi sakin, January 09 2018 pa magiging available ung backpay. Pwede ko ba sila ipaDOLE? REGARDLESS if terminated ka, voluntary resigned, or nag AWOL, ALL EMPLOYEES ARE ENTITLED FOR A FINAL PAY based on our Labor Code. Kahit ano pa reason mo for resigning. 1. Once clearance is fully accomplished, take a photo of it OR simply as your HR admin to give you a photocopy of the said clearance form or send it via email as proof. 2. Make a demand letter. Include the details such as your name, employment period, resignation date, and date of completion of clearance. State on the letter that you are requesting for an immediate release of your final pay (due to whatever reasons you may have) and that you are giving them 1 week to process the payment. Also note on the letter that if they fail to comply on the date you've provided, you will file a complaint at DOLE. 3. Send the letter via post/mail (LBC or something alike) or via email. ALWAYS make sure that you have a proof that you did send the demand letter. 4. Keep ALL the proof such as copy of your clearance form, photocopy of your ID with them, and proof of delivery of the said demand letter to your company. You will later on use this if they fail to comply. 5. If they didn't release it on time, go to DOLE Intramuros or to the branch where your company is covered. I suggest Intramuros branch as they are very helpful at quick with the process. Look for Atty, John Diana or Atty. Gazmin. You may also call them for advise at 527-3000 loc. 605 or 606. **The "1 week" period is considered as "reasonable time" to process by DOLE's chief officer of Legal Division Mr. Gilbert Cacatian. This is what he advised me, make a demand letter and allow them to process it for 1 week. If they fail to comply, you can request a conference thru SENA program of DOLE and they will send a subpoena to your previous company. Make sure to have their complete name and address. I advise you get the details of your company's HRVP ot HR Head. YOUR FINAL PAY IS YOUR MONEY. YOU WORKED FOR IT. YOU HAVE EVERY RIGHT TO REQUEST IMMEDIATE RELEASE. YOU ARE NOT ASKING FOR THEIR MONEY. Some (not all, but most of them :D) HR personnel make it seem like it is theirs and make the process very difficult for their previous employees. ***ALWAYS ASK FOR A COPY OF COMPUTATION. YOU CAN INCLUDE THAT ON THE DEMAND LETTER. THEY NEED TO ISSUE YOUR COE, 2316, FINAL PAY CHECK AND THE COMPUTATION. Ano po ang guidelines ng mga BPO company sa last payslip for backpay? Yung binigay kasi sa akin doesn't have any breakdown on what happened with my gross pay(no explanation about deduction) and how they've come up with the final pay. Ask ko lang po 8mos ako sa company then i did not rendered 30days then upon signing my j.o before naka indicate dun na incase di matapos or macomplete yung 30days if magreresigned magkakarun ka ng deduction na 45k.so since na 14k lang basic dun plus 2k allowance and di ako nakapagrender kasi di na talga kaya dahil wala ng maiiwanan sa mga kids ko.My question po is that possible na ganun kalaki yung ung deductions? Hi, unfortunately asa contract sya. Mas cash bond ka. Pwede ka mag inquire kay Atty. Diana or Gazmin sa DOLE at 527-3000 loc. 605 or 606. REGARDLESS if terminated ka, voluntary resigned, or nag AWOL, ALL EMPLOYEES ARE ENTITLED FOR A FINAL PAY based on our Labor Code. Ano pong phone number ng adp para mag follow up ng back pay? Hi. Tanung ko lang po if makakakuha pa rin ba ako ng back pay kahit 2 years na ako magmula nung nag awol ako. Or makakapag clearance pa rin pa po ba ko? what if nagloan sa sss? ?like october ako nagloan tapos december ako nagresign...3years nko sa company...may makuluha pa kaya ako?? Hi ask ko lang po. need din po ng power of attorney pag kukuha ng backpay ng husband mo.. nagiwan lng kse sya ng authorized letter..sbi po kse ng iba kelangn din daw po un pero not sure po ko. Salamt po sa mkakapansin..
How about if my last day off report is Feb 12? However, 9 po yung sweldo namin? Makukuha ko ba yung 2weeks salary sa 9th? Oh ihohold muna nila yun as back pay? Reasonable Ba yung info na binigay saken kasi, I was informed to wait 60 days Sa final status ng backpay KO from concentric, clear na ako nung January 2018 then yung mga friend KO na nagclearance lately, 30 days Lang yung waiting time. Tapos lagi sinasabi saken Sa email wait na Lang Daw. Delay Daw dahil Sa new tax reform law.. Pahelp naman po. May makukuha parin po bang backpay kahit 2 months mahigit lang sa trabaho? August 2017 po aq na early end then as of this month di pa ko nakakapag clearance, may tendency po bang may makuha pa akong backpay pag cleared na ako.? paano po kung 2 years and 5 mos ka nagwork sa BPO employer mo dati, wala po bang bearing yun sa computation ng final pay? Yung tanging compitation na nasa final pay form ko ay 13th month pay lang at related deductions. other than that walang mga allowances or anything pero nakuha ko na yung sahod ko para sa huling araw na tinrabaho ko. Just wanted to ask po , coz I resigned last August of 2017 and up untill now i did not went yet to my previous company to be cleared . Am I still entitled to get my back pay ? Hello po. I badly need some advise. I received an email that I need to go to the HR office for discussion. Pagdating po dun, I was informed that the company is not happy with my attendance and that pipili daw ako kung magrresign ako or itterminate nila. I asked for those absences and sabi, 10 unapproved absences daw po. Yun po yung time na pabalikbalik sa ospital ang anak ko peru nagfile po ako ng leave and provided docs at approved nman sya sa system namin. Ans sabi ng taga HR namin dapat daw nag email ako.I assume na baka nageemail sila kasi di pa nila natanggap ang docs at hindi ako nkapagreply minsan sa email dahil sa pagaalaga ng baby ko. Under labor code 282 daw, due to 10 unapprovd absence ng reason kaya ang sabi ko, iterm nyu nlang po ako kung yun ang decision nyu peru hindi ako nagloloko sa trabaho. Nung pumunta na ako for my final pay, nakasaad po sa waiver na yung konting halaga nalng po ang maiiwan sa akin dahil deducted na daw po ng mga absences ko,HMO at lost headset. di raw po na include yung SL at VL po dahil dapat nagstay sa company ng 1 yr bago magamit kahit na regular employee na po ako. May karapatan po ba akong magreklamo sa DOLE dahil na terminate po ako kahit na approved nman po ang mga absences ko at wala man lang akong napirmahang letter ng kahit na anong warning or sanction.Immediate po ang pagkakatanggal at right before releasing pa nman po ng 13th month. Pls help po.Salamt ng marami.